Hitting 21 years old is one major milestone for a human being. It is the freedom as some will say. The coming of age. You get to make your own decisions and be held responsible and accountable for them as well. Anyway I remember how I held my first TMNT toy on my hand and made my way to the checkout counter. I paid for it from my savings and my budget had allowed me to get only one out of the four. I chose Donatello that day. 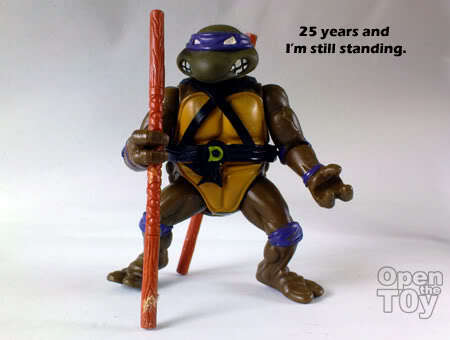 Although for the cartoon and toys it was 25 years but for me and my Donatello, it was 21 years. My Donatello was not without flaws. The moment I took him out of the packaging, his head just popped out of his neck socket. I was devastated. My hard-earned saving! I know cursing at the Toy maker for the QC doesn't help, so I tried my best to restore it. As his head was made of rubber, I tried using hot water to soften the rubber to fit the head back to his neck but with no success. Finally, I decided to cut a gap and fit the head in instead. It was a quick fix and a permanent one. His head still popped out every now and then but I accepted that and played with it extra care. The plastic material became somewhat sticky through the years. I gave him a soap bath occasionally to wash the stickiness off him. Today only 2 bo remained with him. 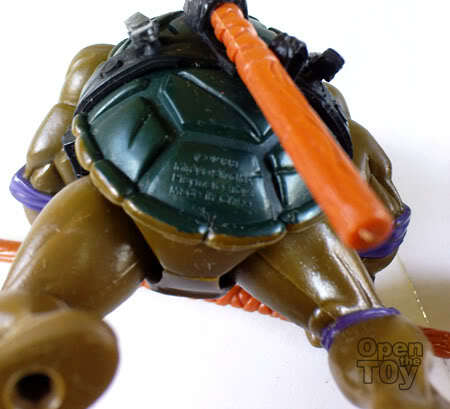 The 1988 trademark still visible on the back of his shell. 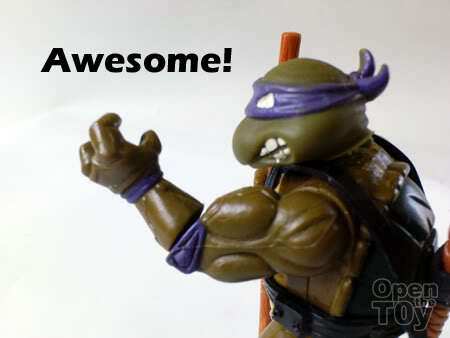 After all this years, Donatello is still look awesome to me. I love this pose but I recall it was Michaelangelo who said that in the 1989 first TMNT Movie. 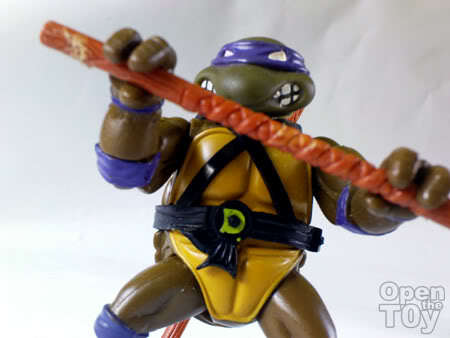 Anyway I'm pretty sure many of you had your TMNT toys and still remember how they taken the world by storm. I bet many of you have all four of them right? If you are looking for TMNT Toys and stuff, you can get it here. I never had the original four. In fact the only TMNT I ever bought during the initial run was Slash. I don't know what happened to my original, but when the 25th anniversary Slash comes out I will get him for sure! In the meantime I just keep looking at garage sales and swap meets, someday I'll find the original four turtles in decent shape! I'm sure it is still in good condition since you kept your toys quite well. That quite a handful you have there. It quite hard to find Leonardo in store last time while Raphael and Michaelangelo seems to be a always around. 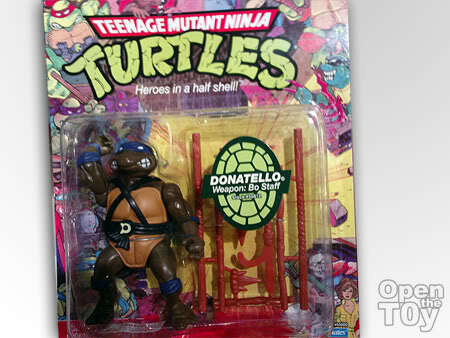 Still having your vintage Donatello action figure. That's so cool! Awesome! TMNT was such a big thing in the past. I think I have the four turtles from the hard head line, not squishy. They are doing pretty good for age. Don's bow has broke free of his holster. Civil War Turtle you ask? He fell off the shelf and had to have his legs amputated. Sorry to hear that Dan. I didn't know there are two different type of head. So which one came 1st? the hard head or the squishy ones? The squishy, or roto heads, came first, yours looks to be the squishy. I have one of each of the four turtles from the first run, Don is by far my favorite. i LIKE the latest TMNT cartoon. Modernized. Initially wanted to buy the Playmate 25th anniversary TMNT, but after saw the paint work and pricing on the products, had decided to skip that..Anyway, I only have the movie version released by Mcdonald.. Indeed, the price was the stopping factor for me. The quality is not any better too. Have you share your McDonald TMNT before on your blog? Actually the price tag for the Movie TMNT isn't that ex. I thought the movie TMNT toys were close to SGD 20.00 each, wasn't it? Their packaging was bigger too. Do you remember how much they were? i never had one of them i found them quit scary wen i was young. now i wish i didn't and has one that old. Old school goodness! Thanks for the pics, leon. Oh- I added your updated Venom banner to my link list. 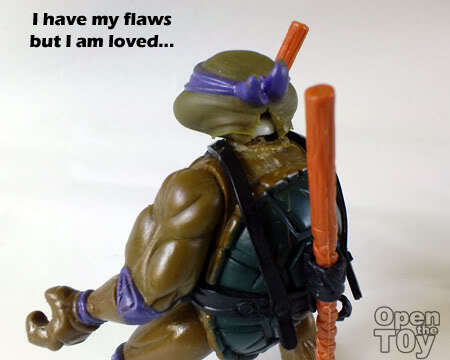 Leon, I didn't post any photos of TMNT (Mcdonald version) before. Thought that is nothing special to review and comment..Haha!! Yes the movie TMNT was about $20 SGD each and Michaelangelo do look funny but that how he was in the movie. Always on the fun and wild side. Unlike the old cartoons version shown on TV, they did not gave the turtles any eyeball (which in the comic they draw the eyeball as well) and with all the muscles, can be intimidating and doesn't look friendly to some young kids.